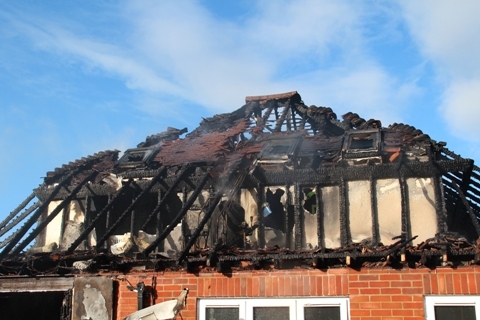 A woman and three children have managed to escape a house fire in the New Forest. It broke out in Springfield Avenue, Holbury at 5.48 this morning (Monday 12 May). 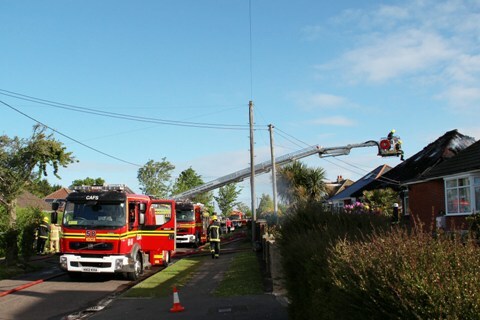 The fire involved a neighbouring garage and the roof of a chalet bungalow. Crews from Hythe, Hardley, Beaulieu, Totton, St Mary's and Redbridge used eight sets of breathing apparatus, three jets, two hose reels and an aerial ladder platform to extinguish the fire. "The prompt action of our firefighters stopped the fire from spreading further. "I would also like to praise the family for being prepared for a fire in their home which may have saved their lives." The family had working smoke detectors, had pre-planned an escape route and had closed all of their doors as part of their bedtime routine. The garage was 100 per cent damaged by fire, the roof of the bungalow was 100 per cent damaged by fire and the ground floor was 25 percent damaged by fire and 75 per cent damaged by smoke. A fire investigation is being carried out to find out the cause of this fire.